My name is Judi, and I have been been an artist my whole life. As a child I would take my lunch money and secretly purchase beautiful inks, and hoard my treasured supplies. I became a school teacher, and taught art classes, then began making portraits, while living the life of a traveling artist. I began to realize how rigid the “rules” that I set for myself were, in the way of how I was supposed to create art. All these years of teaching other people that there are no rules and no mistakes in art, and there I was with so many for myself! My Creative Energy painting is an emergence from this cocoon. I allow the energy to flow through myself and my brush, and work to release this flow from my ideas of what is “right” and what is “wrong”. I work to free it with joyous expression. These new discoveries have breathed a new life and perspective to my portraits as well, showing me new hidden secrets in my subjects, colors and depths. I cannot wait to see what this journey will bring next! This picture of me was taken on the day I stuck my paint brush, wet with blue paint behind my ear without realizing that it went brush-end first. 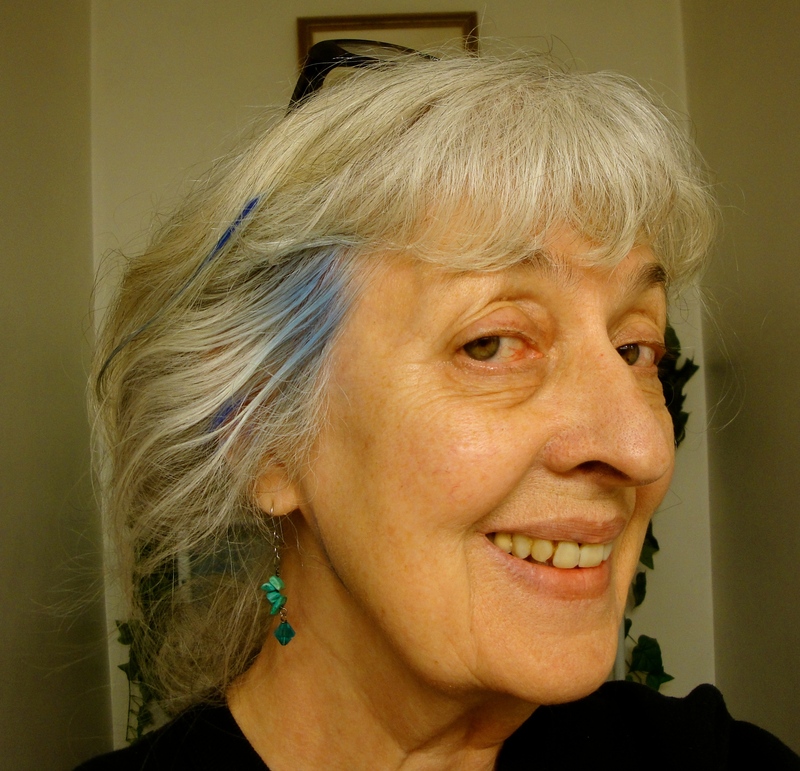 It left and interesting blue stripe in my hair which I found amusing. It was temporary, as so many works of art turn out to be.